Christie has entered into an exclusive partnership with Crystal CG, a digital media company, to supply visual display solutions for the new Bureau International des Expositions (BIE) multimedia exhibition and information center in Paris, France. The Center, a collaboration between Crystal CG and BIE and funded by Crystal CG, will be dedicated to the history of world expos. It will house a permanent exhibition highlighting BIE’s accomplishments, presented on Christie’s multimedia technologies. It will also feature meeting rooms to discuss Expositions, large-scale events and a comprehensive digital research library for delegates, scholars, students and future Expo organizers. The Center held its official grand opening July 27. 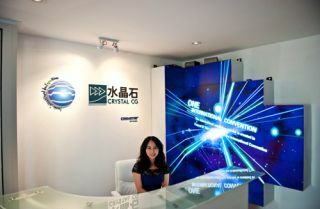 Crystal CG is a major Christie AV partner in China and the Official Digital Imaging Service Provider of the 2012 Olympic Games. As a corporate partner of the BIE Center, Christie will be providing Christie MicroTiles in the reception area, as well as projectors throughout the facility, including the exhibition area, meeting rooms and an immersive first-person experience area. “It is a great privilege for Christie to be the exclusive corporate sponsor and to play a role in the developmental phase of many key international Expositions that will have an impact upon the world stage,” said Kathryn Cress, vice president, Global and Corporate Marketing at Christie. “The BIE is very pleased with this space provided by Crystal CG in the heart of Paris. This showcase is a great opportunity to present and inspire world-class ideas to candidates, organizers and participants, through Christie’s visual solutions,” said Vicente Gonzalez Loscertales, Secretary General, Bureau International des Expositions.